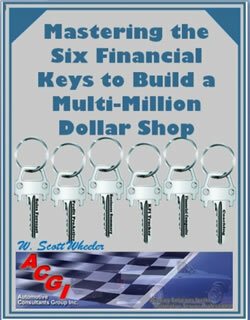 Mastering the Six Financial Keys to Build a Multi-Million Dollar Shop | Automotive Consultants Group, Inc. Using Profit ProActive ™ to determine where you are compared with where you need to be. Understand what your shop is capable of, i.e. # bays, techs, billable hour production, etc. How effective is your marketing? Advertising? Is your staffing in line with your trended forecast? Are your prices adjusted for Merchant Fees? Are you looking at your inventory turns? 6 hours. Can be modified to fit existing time slots.